ProjectMix Price Mixup: What Price Audio + Motorized Faders? How does this sound? 8 channel strips, 8 mic preamps (so you can record your whole band with individual drum mics, for instance), motorized faders and buttons, and compatibility with all major Mac and Windows audio tools from Ableton Live to Pro Tools, all for about US$1000 street. Sounds like a great deal, right? That’s how it sounded to all of us when we saw the ProjectMix I/O from M-Audio at AES. Only one catch: M-Audio is messing around with the price. Now they’re calling the US$1299 price, the one they quoted everyone, an “introductory price.” On January 15, that price gets jacked up $300 to $1599. To make matters more confusing, if you buy January 15, M-Audio will throw in a full copy of Ableton Live — at least at first. Then when they run out, the gear is $1599 without software. 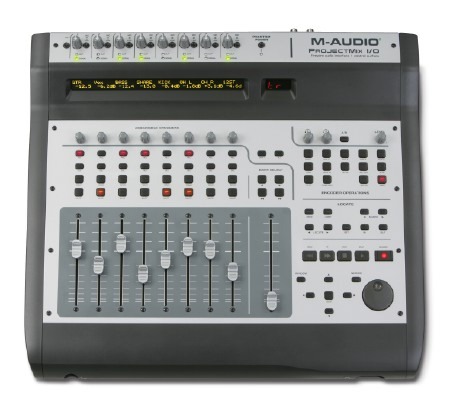 CDM’s W. Brent Latta wisely notes that at the new price, the M-Audio kit costs the same as a Tascam FW-1884, which some might argue is a better choice. Maybe the cost of injection-molded plastic is fluctuating? Can’t tell you. Has anyone actually gotten one of these units in their hands yet? Store are showing it in-stock, but I haven’t talked to anyone who’s tested it yet.